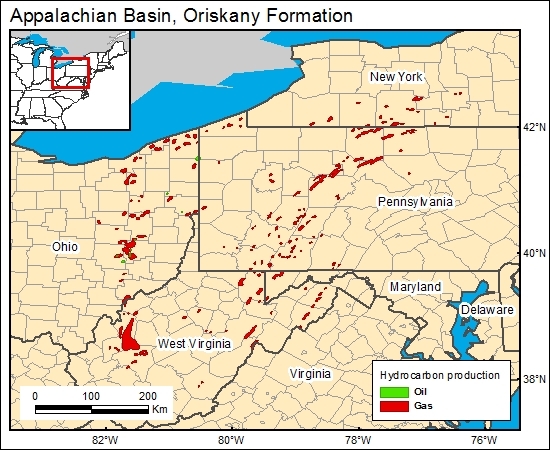 The Oriskany Sandstone has a long history of hydrocarbon production (Diecchio and others, 1984; Harper and Patchen, 1996; Opritza; 1996; Patchen and Harper, 1996). We used the map of Diecchio and others (1984; their fig. 7) to characterize hydrocarbon production from the Oriskany Sandstone. This map identifies fields and pools, but there are numerous exploration wells not identified, as well as wells drilled to deeper horizons (Roen and Walker, 1996). Therefore, more detailed assessments would be needed if actual CO2 sequestration sites were to be sought out and evaluated.